As you may know, my garden is all about supporting pollinators. A variety of bees, butterflies, moths, hummingbirds, and fairly benign wasps honor my efforts by making regular visits. 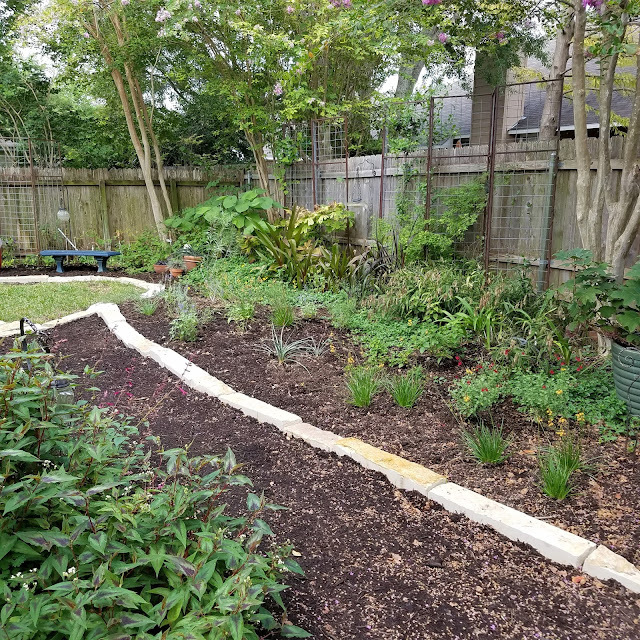 Any plan for coping with changes in the garden had to start with plants that would serve pollinators as food, housing, or as a host for their offspring. For its new companions, I chose snake plant (Dyschoriste linearis), red Salvia greggii, Skeleton-leaf goldeneye (Viguiera stenoloba), bulbine (Bulbine frutescens), 'Ham and Eggs' lantana (Lantana camara 'Ham and Eggs'), 'Provence' lavender (Lavandula x intermedia 'Provence'), and Hesperaloe parviflora 'Brakelights'. All new plants were purchased from trusted local nurseries able to verify they've been grown without neonics or pesticides, so my insect visitors aren't simply attracted to plants that would kill them. This new area is already alive with hummingbirds and a variety of bees and butterflies. That's the only seal of approval needed! Finally it also seemed the right time to replace the bricks that have served as a temporary border for a constantly shifting edge. It's taken years to convince my sweetie that our home's resale value might not actually suffer from the removal of turf, so each year our flower beds would quietly encroach a little more. We'll keep small areas of green to help slow the movement of storm water across our lot, never fertilizing or fussing over it; and you can see what we're calling The Great Lawn at the end of the path and new bed. It's actually slightly bowl shaped so it fills with water that soaks into the soil within a few hours. So once again my garden reminds me change can be challenging, but that it's comforting and exciting to create the next chapter in my garden's growth. Gail - it WAS a big tree, but one that seems to have a 20 year life span here. It was shedding limbs at an alarming rate and we were relieved to have it gone when the high winds from Harvey hit. The garden keeps giving me lessons on flexibility and change, but they're usually gentle and positive. I grumble about change too, but then I get excited. New plants -- whoo! I look forward to watching your desert willow grow. If I may make a suggestion -- never water it once it's established. I had one in my last garden, and it got lanky and eventually fell over because it was in amended garden soil and got watered once a week. I was too nice to it! I lost a big tree a little over 2 years ago and you are right...it has been a good lesson in change ...I even took some things out just a few weeks ago that struggled along but never really got over having to live in full sun. Nice to see you have adjusted to the loss of your tree. I always find it amazing how quickly we gardeners seize this opportunity to come up with something that is actually better than what we had before. 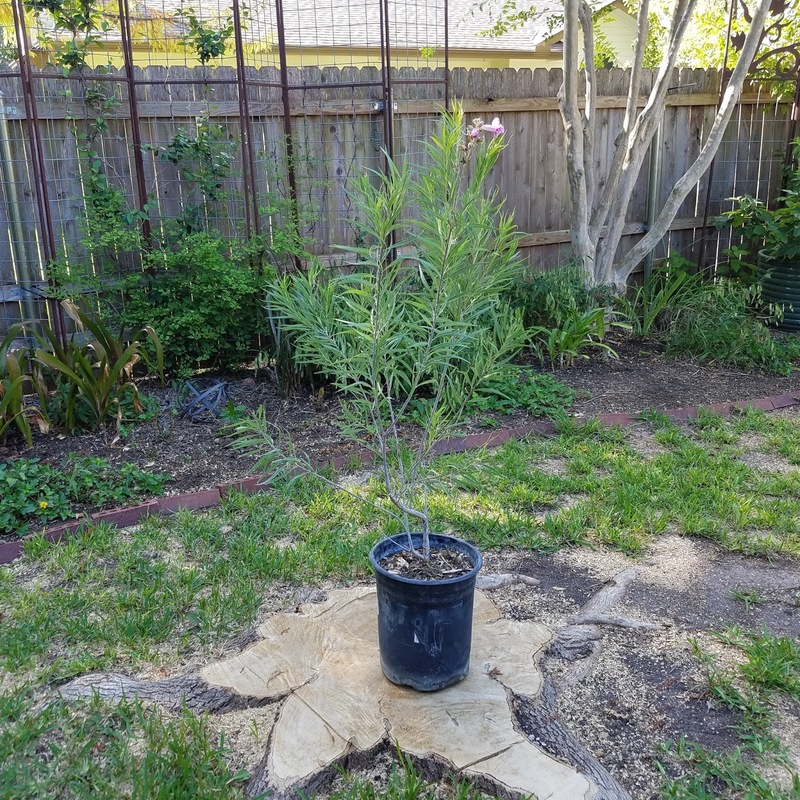 Your desert willow will be wonderful and give that whispy shade that so many plants thrive on in Texas. A sunny garden offers the opportunity to grow more sun loving flowers that will bring those pollinators flocking to your garden. It's going to be hard not to coddle it. Best I could do was give it well draining soil. My anacacho orchid also suffered from a serious lean once it hit 15 feet and the winds would toss the canopy around. Harvey winds split 2 large sections off and damaged the main trunk so it's now scheduled for a hard pruning to see if it can be salvaged. I'm not the best at yanking out struggling plants but vowed last year to be a better editor where it's called for. Thanks for lending motivation! With all if you guys reminding me it was an opportunity to shop for more plants, it was a challenge to remain glum. Hope you'll have a chance to see it when you're here for the 2018 Fling. You ARE planning to come, aren't you? Beautifully put Vicki :) I'm deeply envious of your hummingbird visitors! It is so nice to read about plants which are foreign to my locale. Thank you for that education. Your choices sound divine and I do love the texture of your new tree. That is quite a stump left by the old....sigh, nothing stays the same. I'm sorry you lost your big tree, but that wispy Willow is a wonderful replacement choice, methinks! It's going to be beautiful! Wow, that's a huge stump, and a big change. Good luck with the transition. Sometimes changes that are forced on us can be positive. The huge Norway maple that shades my in my neighbour's yard is starting to look ready to receive the "dreaded orange dot" – aka, the mark of death. So I might be following in your footsteps way up here. Cheers, Vicki.